The Tibetan National Congress is pleased and proud to support the candidacy of Lukar Jam Atsock for the position of Sikyong. Lukar Jam’s candidacy represents a truly positive advance over the status quo politicians who have failed to deliver the changes that the Tibetan people desperately need. The Tibetan people need progress on relations within the exile community; the government-in-exile; the view that China takes of Tibetans; the direction of the Tibetan struggle; and the way the Tibetan struggle is perceived by the outside world. He is the only candidate who is pledged to change this status quo. Lukar Jam is the only candidate who knows Chinese rule up-close: he lived a good part of his life under that rule. He has personally confronted Chinese power inside Tibet, and paid the price in imprisonment and torture. Lukar Jam reads, speaks and writes Chinese. He understands China and its Tibet policy directly, not by relying on second-hand translations or second-hand opinions but by interacting directly with Chinese people, their writings and their ideas. More importantly, Lukar Jam is the candidate who knows, based on long personal experience, how best to connect with our sisters and brothers inside Tibet. He is the leader who can build bridges between those inside Tibet and those in exile, and forge a greater unity for the entire Tibetan people. Lukar Jam knows in his heart that Tibet is a nation. He knows Tibet’s nationhood is not something to be given away, or used as a bargaining chip. He knows it is the entirety of the struggle itself, and that this fact alone is what makes our struggle so strikingly just. Like the patriotic Prime Ministers Lukhangwa and Lobsang Tashi in the 1950s, he is not afraid to stand up for the Tibetan nation and for its spiritual leader, His Holiness the Dalai Lama. Unlike other candidates, Lukar Jam makes no distinction between what is in his heart and what is in his words. He doesn’t try to confound people by pretense: he does not tell Tibetans that he supports freedom while telling non-Tibetan audiences that he is fine with Chinese Communist Party rule in Tibet. Lukar Jam stands firmly for the principle of non-violence. And he understands that non-violence does not mean the surrender of Tibet’s nationhood. He understands that it means standing firm on what is just: non-violently but with steady commitment, even in the face of overwhelming odds and brutality. This refusal to compromise justice, combined with non-violence, is the essence of Gandhian struggle. Lukar Jam’s non-violence is based firmly in the truth of the Tibetan cause. Lukar Jam stands for democracy within the exile community and for our sisters and brothers in Tibet. He opposes the suppression of free speech not only inside Tibet but in exile society as well, as happened in the censorship of political expression in this year’s March 10th rally in New York City. For these clear reasons, we are convinced that he will impart vigor to a struggle that has been plagued in recent years by feeble acts and disingenuous words. He will inspire people with a renewed commitment to Tibet’s nationhood; he will use the mechanisms of the Tibetan government-in-exile for that sole purpose, not as a tool for promoting personal ambition or rewarding friends and supporters. Lukar Jam is the very candidate Tibet needs at this crucial and perilous moment. 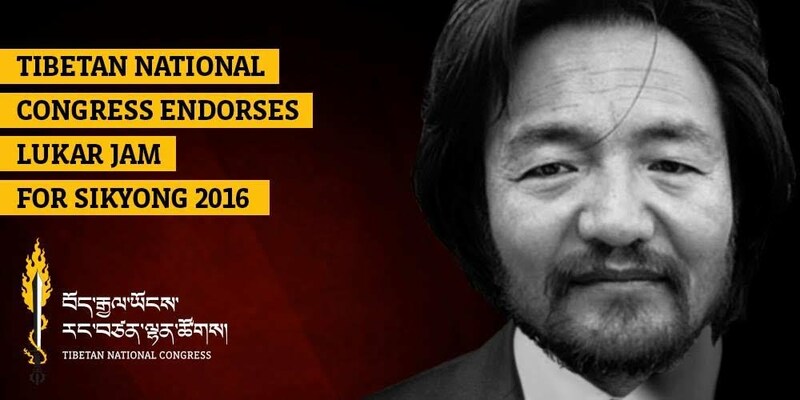 We proudly endorse him to become the next Sikyong. The Tibetan National Congress (TNC), is a political national freedom movement. It is a non-sectarian, non-regional, pan Tibetan movement that seeks to pursue the ultimate goal of the restoration of Tibetan Independence, to bring about a Renaissance of Tibetan society of Tibet’s ancient culture, literature, language, and history, and to uphold and vitalize the principle of a democratic society gifted to the Tibetan people by His Holiness the 14th Dalai Lama.